Benjamin Franklin (1706-1790) often amused himself and his newspaper and almanac readers in colonial America with "Mathematical Diversions." He discovered a method of constructing magic squares of sequential numbers that would create the same sums in the rows, columns, and diagonals. 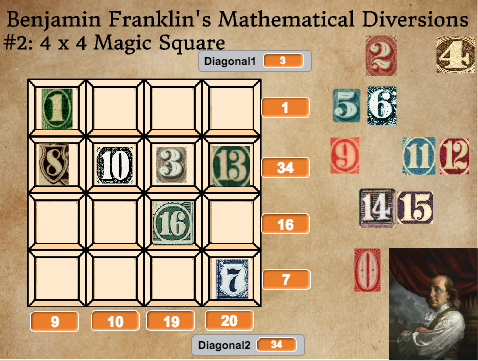 This is one of his 3 x 3 magic squares. 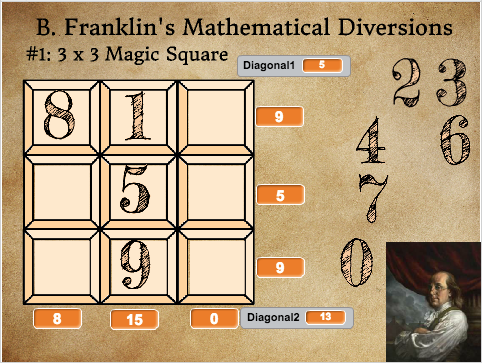 Use nine of the numbers to create a Franklin Magic Square by clicking and dragging the numbers to empty spaces on the grid on the left. There is more than one solution.